A cooling process is underway in the South Florida residential real estate market. Prices are stretched and buyers are finally taking notice. It has been ten years since the housing bust and some of the same behavior is present in the market today. Let’s look at a few charts. During the month of August, it looks like the sale prices of condo properties in the Fort Lauderdale area have already cooled. 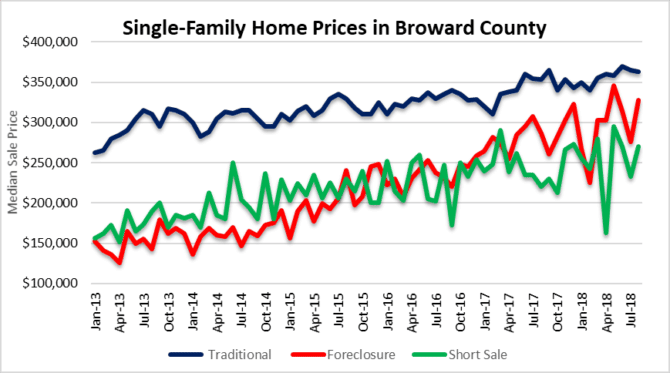 Our first chart today is a quick snapshot of traditional, short sale and REO sales in Broward County. It looks like the median sale prices have stopped climbing also. Its just a matter of time before the flippers get stuck with their properties if they don’t make price adjustments. If you haven’t already noticed, the yard signs in your neighborhood have been sitting there awhile. Get used to it! Not cooling, rates are heating-up! 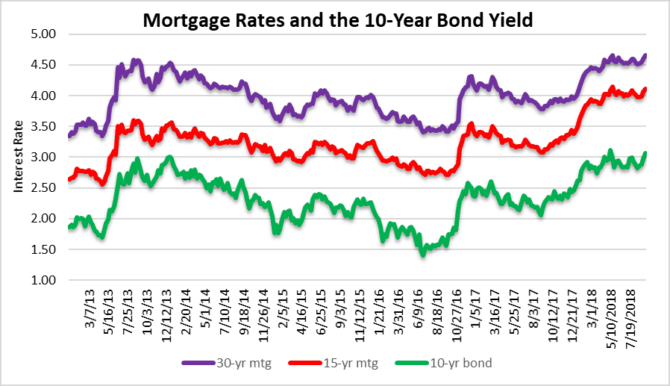 The trend in mortgage rates is higher and will continue to add downward pressure to real estate prices. We are looking for the next move in the 10-year bond over 3.12% and its off to the races. We just surpassed levels from June and the next rally could take us to levels that we haven’t seen since the financial crisis. People forget how low rates have been since 2009 and they have been a big factor in propelling real estate prices to bubble heights. As mortgage rates grind higher, you will see residential real estate prices decline. This is just basic math and the low rates that lifted prices will have the opposite effect on real estate prices as rates climb. Residential transaction volume in the Fort Lauderdale area has been good so far when compared to the past six years. We anticipate that deal volume will decline for the balance of 2018 and continue to soften in 2019. Keep an eye on deal volume. As it slows, prices will follow it downward. 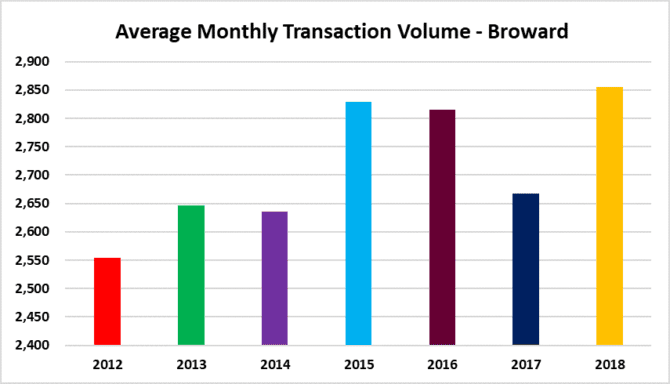 This chart shows the average monthly residential transaction volume. When it comes to residential real estate, California usually leads the way. Here is a good article on the California real estate market and the recent price activity. 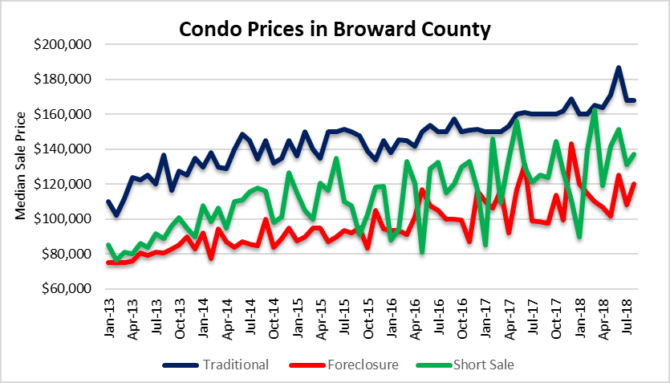 This entry was posted in Condo market, Fort Lauderdale real estate, Market Insight, Mortgage rates, South Florida Real Estate and tagged Fort Lauderdale condo market, Fort Lauderdale housing market, Fort Lauderdale real estate, housing bubble. Bookmark the permalink. Both comments and trackbacks are currently closed.